Click on any photo on this page to see the image in greater detail. The Egyptian word gallabiya refers to a full-length tunic-style garment. The word applies to both the men's version of this item and also to the women's version. An alternate spelling could be jellabiya. In English, the word "dress" would be used to refer to the style of gallabiya worn by women, whereas the word "robe" would usually be used to refer to the men's garment. Gallabiyas are still widely worn by Egyptian men as everyday attire, particularly those in the shaabi social classes such as farmers, drivers of donkey carts, or people holding other outdoor jobs. The cotton fabric and loose fit provide comfort in the heat of Egyptian summers. The gallabiya is particularly associated with the Nile valley more than with the desert or coastal regions. The gallabiya would be the appropriate costume for a male dancer to wear when performing an Egyptian stick dance. Typical colors for a men's gallabiya could be solid white, beige, olive, brown, or light blue. Sometimes a gallabiya will feature vertical pin stripes. Men will often wear matching straight-leg pants underneath. On the head, a man in a gallabiya will often wear a particular style of turban that is typical of Egypt. A rectangular scarf draped around the neck is sometimes included in the ensemble. The men's Egyptian-style gallabiya does not have a collar. A slit in the center front enables the garment to be pulled over the head. Sometimes there is a pocket on one side of the chest. The cut of the body and the sleeves is quite loose. Some men may wear suits and ties during the day, then switch to a gallabiya for comfort when spending the evening at home with family. Others won't wear a gallabiya at all. Among Egyptian musicians, the ones who play the typical classical orchestral instruments (violins, qanouns, accordions, tablas, ouds, etc.) will normally wear formal suits with dress shirts and ties. However, when it's time for the folkloric segment of a show, the musicians who play the rebaba, tabla baladi, ney, and other folkloric instruments typically enter clad in gallabiyas. The photo to the right shows members of the band Musicians of the Nile playing rebabas. "Baladi dress" is one of the most misunderstood terms used by North American dancers when discussing dance costuming. The term refers to the traditional style of dress worn by women in Egypt. The word baladi itself means "country" and refers to the culture and values of rural village life. Therefore, in costuming for Oriental dance, a baladi dress would be a dress in the style of what people wear in the villages. The traditional clothing worn by women from the baladi culture consisted of a loose-fitting cotton dress with long sleeves and a slit in the center front at the neck to allow the garment to be pulled on over the head. For Cairo-style dresses, there is a rectangular yoke in the front of the bodice area, which may contain embroidery. Another name for this dress style would be gallabiya - the same word used above to refer to the men's garment. 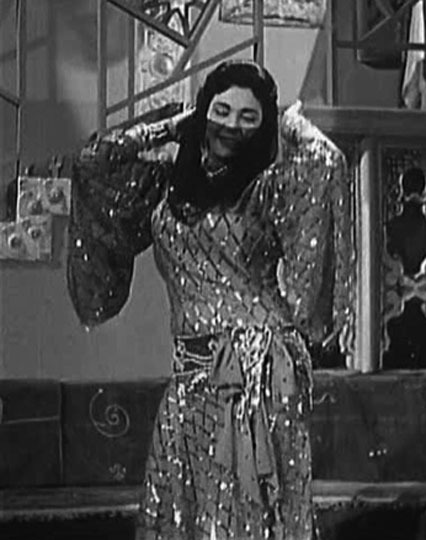 The photo to the right shows Tahia Carioca wearing a baladi dress with theatrical embellishments in a scene from the movie Mufattish al-Aam (Inspector General). 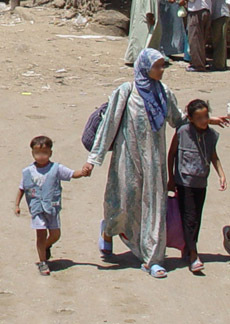 The photo to the right shows an Egyptian woman going about her daily business wearing a women's gallabiya (baladi dress) intended for everyday wear. This photo was taken by Shira when visiting a baladi neighborhood of Cairo in 2004. Today, these baladi dresses remain common as everyday wear in some parts of Egyptian society. Ever since Fifi Abdo wore a men's white gallabiya in the 1990's as part of depicting a ma'alima (woman business owner) character in a play, it has been fashionable among Egyptian-style dancers around the world to wear them for Fifi-like tableaux of their own. This has led some people to incorrectly believe that only the white men's garment can be called a gallabiya. In fact, when referring to women's clothing the terms gallabiya and baladi dress are interchangeable, although the styles worn by men and women are somewhat different from each other. The type of baladi dress used for everyday wear tends to be sold in neighborhoods where local people are likely to shop. A variant of the baladi dress is also sold in the markets that focus on tourists. The photo to the right shows a gallabiya that Shira purchased at such a tourist shop. This particular dress was machine-embroidered and mass-produced for the tourist industry, but is suitable for use as a dance costume for the non-Saidi flavor of baladi. In everyday life, a hip scarf such as the one in the photo would not be worn with a baladi dress. However, if a woman gets up to dance at a wedding or other family party, she would typically tie on some sort of hip scarf before starting to dance. The particular hip scarf in this photo was produced by a dance costume supplier in Egypt for export to the foreign market. Some dancers incorrectly use the term "baladi dress" to refer to every style of dress they can imagine being used with Egyptian dance, even the evening gown style of dress Egyptians typically refer to as either badlat raqs or fustan raqs. The section below titled The Evening Gown offers some guidelines on how to tell the difference between a baladi dress and a fustan raqs. Saidi dresses are baladi dresses from a specific region of Egypt. See below for more details on what distinguishes Saidi dresses from other types of baladi dresses. Strictly speaking, the gargar (fellahin dress) described below is also a type of baladi dress, because it is a traditional village style of garment. However, most Oriental dancers don't think of this particular style when using the term baladi dress, so this would be an example of how dancers outside of Egypt sometimes use terms in ways that might not align with how people in the Middle East understand those words. The diagram to the right shows the traditional shape of this dress style. Gussets would have historically been used in the armpits for freedom of movement. Today, however, sleeves would typically be set in. Costume designers might use V-shaped necklines or U-shaped necklines instead of the jewel neckline shown here, and they might make the body of the dress more form-fitting. When making a Saidi dress from tulle bi telli (see below), the designer may opt for a boat neck and use gussets in the armpits, to avoid cutting into the precious fabric any more than necessary. Typically, baladi dresses made for use as dance costumes would be long-sleeved, although sleeveless or 3/4 length are possible. If long sleeved, they would usually be loose at the bottom, such as bell sleeves, and not gathered to a cuff. Short sleeves or cap sleeves are not common on baladi dresses. However, they have occasionally been used. 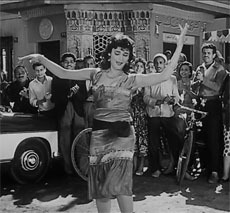 Samia Gamal wore a short-sleeved baladi dress in the movie Sigarah wa Kass (A Glass and a Cigarette) (see the movie still at the right), but this is not typical. The Said is the part of Egypt south of Cairo known as Upper Egypt. Some towns in the Said include Luxor (ancient Thebes), Sohag, Qena, Edfu, and Assuit. The term Saidi refers to music, dance, clothing, and other traditional cultural elements that come from the people who live in this part of Egypt. Because the Said is a rural area, it is valid to say that Saidi folk culture is a subset of baladi. 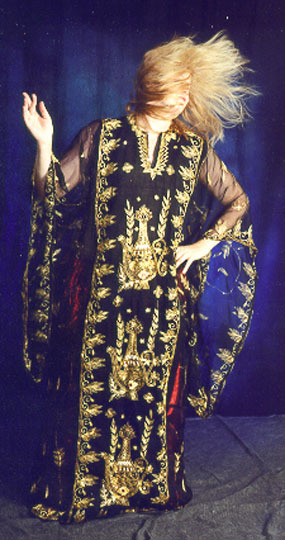 A Saidi dress can be worn for either Saidi-specific style of dancing or for generic baladi dancing. Saidi culture is essentially the baladi culture of that part of Egypt. A Saidi dress would be the best choice of costuming for Egyptian-style raqs al assaya (stick dance). 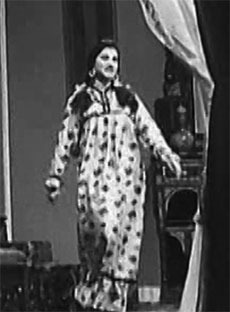 The "classic" Saidi dance costume included a straight-cut somewhat loose tunic with long sleeves and a modest neckline. The side seams would be left open up to knee or hip level as slits that revealed the leg. It was worn with a mandil (head scarf) and hip scarf, as shown in the photo to the right. 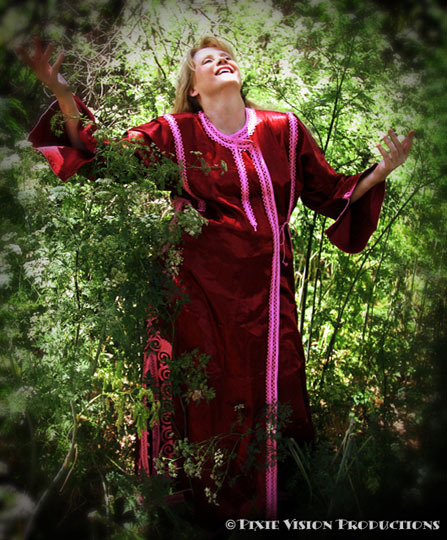 Dancers often wonder what differentiates a Saidi dress from any other type of baladi dress. Usually, this depends on the fabric or decoration. The sheer black dresses that I'm wearing in both the above photo and the one to the right are made of a fabric known as tulle bi telli (net with plating, such as silver plating). Europeans and Americans often called it assuit because the city of Assuit in Egypt was particularly known for making it. Since the city of Assuit is in The Said, the tulle bi telli fabric is ideal for a dress for Saidi dancing. For many years, Reda Troupe used this fabric for their women's Saidi costuming. Traditionally, a dancer performing in a tulle bi telli dress would either line it with an opaque fabric, or would wear another garment under it, such as a leotard or a slip. In this photo, Shira is wearing a colored unitard under the assuit dress. The unitard is not a traditional look. Fabric with vertical stripes is also a popular choice for Saidi-style dresses. Baladi dresses representing other regions are more likely to be made from a solid color fabric. Other stylistic elements often seen with Saidi dresses include sleeves that flare at the wrist. The center front often has a slit enabling the dress to be pulled on over the head. Since around 2000, costume makers have moved in the direction of making these dresses sexier. The current fashion tends to be more form-fitting, often using stretchy lycra fabric, with lower necklines and higher side slits. The one on the right was made in 2010 by Mamdouh Salama. Instead of a mandil, it came with a headband. One popular look today is for these dresses to have a U-shaped neckline that plunges deeply down to the abdomen, fully exposing a matching costume bra. 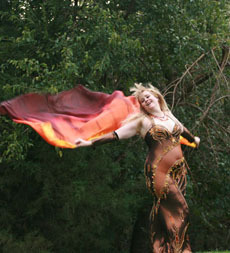 Modern-day dancers who perform with a melaya are portraying a particular type of person - a woman who would wear a melaya. The melaya was an outer garment which used to be particularly popular among the urban baladi social classes in Cairo and Alexandria, Egypt. Because it was a traditional garment, the melaya was incorporated into dancing by Hekmet Fahmy, Samia Gamal, Tahia Carioca, and other dancers in movies that were set in urban baladi neighborhoods. In the latter half of the 20th century, the melaya began to decline in popularity among Egyptian women. By the late 1990's, it was rarely seen any more. Hekmet Fahmy danced with a melaya in a movie in 1939, and Samia Gamal and Tahia Carioca used them in movies of their own in the early 1950's. Many dancers today associate melaya leff dancing with Reda Troupe, which came later. Reda Troupe's work was based on Egyptian culture of the 1950's and 1960's. For that reason, the costuming used for their melaya dances was based on the style of clothing fashionable among urban young women of the time. Reda Troupe serves as the primary influence on modern day dancers who seek to create performances that incorporate the melaya. Therefore, most melaya leff performances today apply the Reda-style costuming aesthetic inspired by 1950's/1960's women's fashion. Some dancers opt to wear a yashmak (face veil) when dancing with a melaya. Usually, the style of yashmak used for dance costuming is the crocheted (or similar openwork) style shown in the above photo of Farida Fahmy, which hints at the original garment but without interfering with the dancer's need to breathe freely. A similar yashmak was worn by the child star Fairouz Arteen in the 1951 motion picture Fairouz Hanem (Lady Fairouz). It is also valid to use a melaya in a dance without the yashmak. PHOTO CREDIT: The photo of Farida Fahmy on the right was provided to Shira by Mahmoud Reda for use in illustrating her articles about his body of work. She is holding a melaya and wearing a dress in the style that Reda Troupe used for dances portraying women of Alexandria and Old Cairo. The image of Nagwa Fouad on the right shows an example of this type of urban baladi dress that inspired the theatrical "melaya leff dress" we use today. 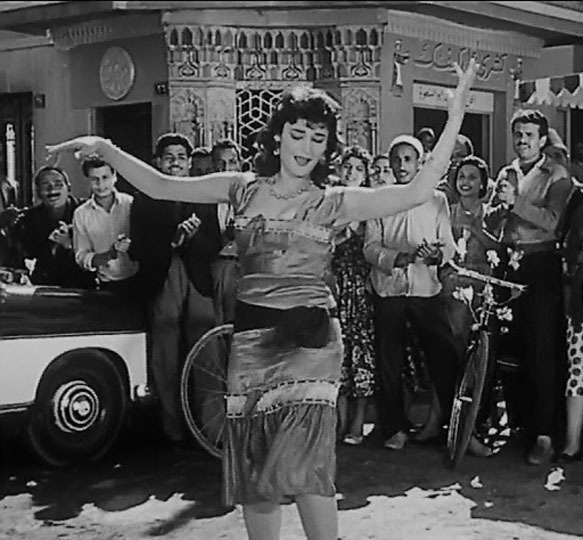 This scene came from Nagwa Fouad's silver screen debut in the 1959 movie Sharia el Hob (sold on DVD with English subtitles as Love Street). The scarf around her hips is not a typical accessory for this dress style - it's something the character depicted by Fouad tied on when she started to dance. Fouad's hair style just barely grazes shoulder length - which was very much in style at the time. 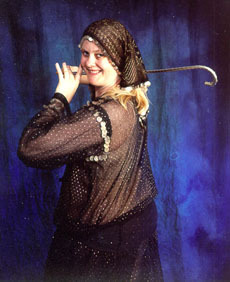 Therefore, it could be appropriate for a performer using a melaya leff to wear her hair loose, at shoulder length. However, as shown in the photo of Farida Fahmy above, it could also be correct to wear long braids on each side. Fouad is not wearing a head scarf in the above photo, and therefore a dancer choosing to model her costuming aesthetic on the baladi neighborhoods of Cairo from the late 1950's wouldn't need to, either. 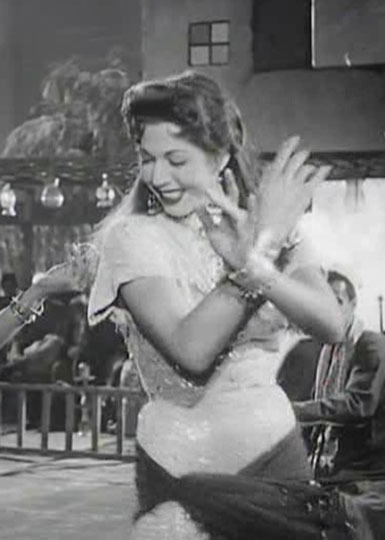 For dancers who prefer to wear something on their head to complete the look, one option could be a scarf as shown in the photo of Farida Fahmy above, or alternatively a decorated headband, as shown in the movie still to the right of the five dancers. The image to the right shows a dance scene from the 1976 Egyptian motion picture El Fatinah w-l-Salouk (sold on DVD with English subtitles as Beauty and the Scoundrel). The scene is set in a baladi neighborhood of Cairo. This film illustrates a later version of the knee-length dresses and shoulder-length hair style with headbands. This scene begins with the women wearing melayas. Then it cuts to a different camera angle in which the women are no longer wearing them. Today's typical melaya leff dresses tend to be knee-length sheaths with varying sleeve and hem treatments, often made from stretchy lycra fabric. They may be either sleeveless or short sleeved, sometimes even with a short sleeve on one side and sleeveless on the other. The hemline may be either straight or slanted. The skirt may be either straight or flared. If straight, it may have a ruffle. The photo to the right shows Shira wearing a typical example of this style of dress. 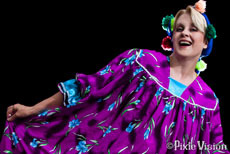 Although the traditional color for the melaya (wrap) is black, many dancers choose to use a brightly-colored melaya that contrasts with the dress for purposes of better theatrical effect. A baladi dress in the style of Cairo or Alexandria would also be appropriate garb for dancing with a melaya. However, a gargar (fellahin dress) or Saidi-style dress would not be recommended. Many people familiar with Reda Troupe's performances think of a fellahin dress as having a shoulder yoke, to which is attached a full gathered section similar to that of what we would think of as a smock or nightgown, with a ruffle on the bottom. People associate this dress style with the farmers of the Nile Delta region of Egypt, and typically associate it with dancing with a balas (water jug). According to Mahmoud Reda, the traditional dress which inspired this look was known as gargar. This dress style was called this because the dress was long enough for the ruffles to trail behind the woman as she walked, and the word gargar means something that sweeps behind. For dance performance purposes, Reda Troupe made the dresses short enough to be usable on stage, and also made them much fuller for theatrical effect. The image at the right is from a scene in the Egyptian movie Mufattish al-Aam (Inspector General). 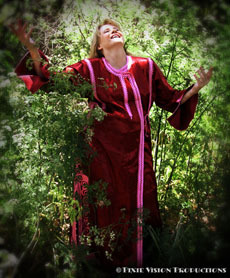 It shows the singer Mawaheb in the role of a peasant girl wearing a dress in the traditional style which served as the inspiration for the Reda Troupe fellahin dresses. When performing in a Reda-style fellahin dress, some dancers choose to wear long brunette braids that come down the front of the body. Many dancers will hide their natural hair under a mandil (head scarf) and wear false braids to achieve this effect. The mandil is often decorated with colorful ooya (pompoms) along the edges. In the photo to the right, Shira is wearing a made-for-the-stage Reda-style gargar. Choreographies often involve picking up the dress and holding it or swishing it, so it's advisable to make the dress full enough to do that easily. Just as the word gallabiya can be used to refer to either a man's garment, or a woman's garment, so can the word thobe. It is a loose-fitting full-length tunic. Other ways to spell this could be thaub, taub, or thawb. The men's garment may also be referred to as a dishdasha. The Palestinian thobe is the best-known dress style from the Levant, due to efforts by the Palestinian people to preserve knowledge of this cultural art through museum exhibits, books, and documentaries. This style of dress was typical of what people wore in the early 20th century in what today we know as Palestine, Lebanon, and Israel. Typically, each village would have its own featured embroidery thread colors and designs. Some village designs would be based in satin stitch, while others were based in cross stitch. The Syrian version of the thobe differs from that of the Palestinian in a couple of ways. One difference lies in the shape of the yoke. While a Palestinian thobe is made with a rectangular bodice, the Syrian version is made with a diamond-shaped yoke. Another difference lies in the style of embroidery. The Syrian version is mostly solid cross-stitch embroidery across the yoke, with small diamond-shaped sections left plain for the fabric to show through. The bottom edge of the bodice area shows a triangular motif protruding downward toward the hem. The cut and embroidery style of a Bedouin thobe from the Sinai region of Egypt is very similar to that of the Palestinian one shown above. However, the Egyptian Sinai style of thobe features much more embroidery on the skirt, front and back, whereas the Palestinian style does not. The dress in this photo is specifically Bedouin in origin. The Bedouin were not the only ethnic group in Egypt, and other ethnic groups wore other styles of dresses. The sections of this article titled "The Baladi Dress" and "Saidi" (under "The Egyptian Gallabiya" and "The Fallahin Dress" for some of the other clothing styles traditionally used in Egypt. The thobe al-nashal is a loose-fitting dress associated with the Arabian peninsula (Saudi Arabia, Kuwait, etc.) Dancers often refer to this garment as a Khaleegy dress because the word Khaleegy means "Gulf" and is a reference to the Persian Gulf. Although it's correct to call this a Khaleegy dress, it's important to realize there are other dress styles typical of the region as well. This particular style of thobe is intentionally designed to be long enough to drag on the floor and form a train behind the wearer as she walks. When wearing a thobe al-nashal, the dancer picks up the dress and holds it to keep it off the ground, as shown in the photo to the right. 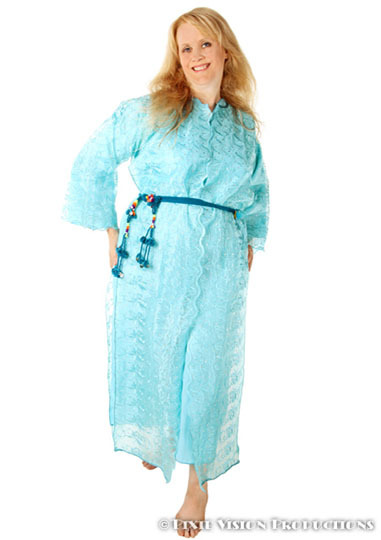 The thobe al-nashal features a very heavy embroidery design down the center front. Embroidery elsewhere on the thobe is more sparse. The word thobe means "dress" and al-nashal identifies the particular style of dress. 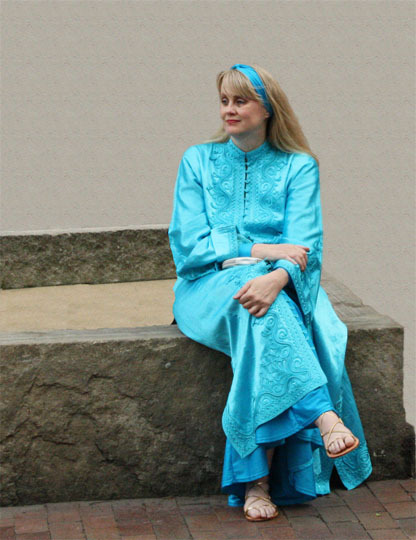 This type of thobe was traditionally used as women's formal wear for weddings and other special occasions. A woman going to a wedding or other dress-up party would wear her normal fashionable clothes, whatever those may have been for her socioeconomic class and the fashions of the times. She would carry the thobe al-nashal, which is a traditional garment, with her. After arriving, she would take out her thobe and put it on over her regular clothes. She would wear the dress both for dancing and for watching others dance. This photo provides a better look at the cut of the thobe al-nashal. As shown in these photos, the center front section of the thobe with heavy embroidery from neck to hem is narrow. This design element of an elaborately-decorated central panel is seen in other Khaleegy dress styles, and helps differentiate a Khaleegy thobe from those of Palestine, Syria, or Egypt. The thobe al-nashal, like the thobe styles from the Levant and Egypt, features a jewel neckline with a center-front slit allowing the dress to slip over the head. The embroidered front panel is about the same width as the shoulders. The thobe is appropriate attire for dancing raqs al nashaat, which is the traditional hair-tossing dance of the region. This dance, pictured in the photo to the right, is sometimes called samri. In the 21st century, the use of the thobe al-nashal has become less common at Khaleegy weddings. Today's younger women often view them as old-fashioned. The abaya is a type of coat, an outer garment that is meant to be worn over the top of other clothing when going out in public. Its purpose is modesty. Some abayas may have front openings, whereas others are designed to be pulled on over the head. The abaya is mostly associated with countries on the Arabian peninsula, such as Saudi Arabia. These Gulf Arabs will continue to wear their abayas when visiting other countries such as Egypt. In Egypt, only a small minority of local women wear abayas, those from the most conservative Muslim families. Such women are also likely to wear black gloves to cover their hands, black knee socks to avoid exposing any skin at the ankle, and black niqaab (face veils). In the photo to the right, a light turquoise abaya is being used as a cover-up over a darker turquoise dance costume. Although abayas may be brightly colored, the most conservative ones are black. Some may feature black-on-black glass beading designs or embroidery. The fabric used to make abayas is usually either double georgette or crepe. Abaya fashions can vary from one year to the next, just as other clothing fashions do. Dancers find abayas and other garments useful as cover-ups, to hide the dance costume when not on stage performing. It's probably best to avoid using a black one as a dance cover-up, since the most conservative abayas are black. In the photo to the right, a burgundy abaya is being used as a cover-up over another dance costume. Both the turquoise one above and the burgundy one to the right were made in Egypt. The embroidery designs on both were created using a technique known as "couching". The technique consists of attaching pieces of ribbon to the garment in a design. The takshita is a garment that comes from urban Morocco. It is a two-piece dress. The inner dress is a simple sleeveless sheath made from a plain fabric. It slips on over the head. The overdress is an ornate long-sleeved garment, often made from either a lacy fabric or a light brocade. It is open down the front. A belt over the ensemble completes the look. This style of dress would be appropriate for performing the Moroccan dance known as the shikhatt. Dancers often incorrectly refer to the evening gown style of costume as a baladi dress. This error shows a lack of understanding what the word baladi means. Costume designers in Egypt recognize that evening gowns and baladi dresses are two entirely different fashion statements, associated with entirely different dance/music styles, and dancers need to learn this as well. An Egyptian costume designer would refer to an evening gown style of costume as either a badlah raqs or a fustan raqs. Either expression is equally correct. The word raqs means "dance". The word fustan means "dress" and the word badlah means "suit". The word badlah can also alternatively refer to the midriff-baring bra/belt/skirt costume. In contrast, that same Egyptian costume designer would refer to a baladi dress as a gallabiya. A fustan raqs often contains a built-in bra. A baladi dress does not, although a baladi dress may be designed with a low-cut scoop neckline that exposes a matching bra underneath. A fustan raqs often contains cutouts, which may be lined with see-through mesh. A baladi dress does not. For example, see the crazy diagonal cutout in the above photo of a copper-colored fustan raqs designed by Hanan. A fustan raqs is usually cut with a form-fitting shape. A baladi dress is usually (but not always) cut with straight side seams, to make a rectangular shape. A fustan raqs may have a flared skirt. A baladi dress would typically be more of a straight sheath cut. A fustan raqs may contain design details such as ruching, gathers, and gores. A baladi dress would be a much simpler garment design, with simple straight side seams. Note the gathering in the right-hand side seams of the purple fustan raqs by Eman Zaki in the photo to the right. A fustan raqs will usually have a designer neckline. A baladi dress will usually have a simple neckline, such as a V-neck, front slit, or U-shape. A fustan raqs is designed to be worn without a hip scarf. 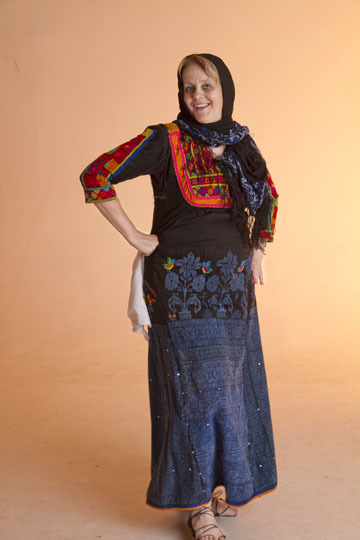 A baladi dress is usually designed to be worn with a hip scarf or belt. A fustan raqs may contain slits to show off the legs. These can often be found in center front, side front (centered over one knee), or center back. If a baladi dress contains slits, they are typically on the side of the garment, and achieved by leaving part of the side seam of the dress unsewn. A fustan raqs typically contains heavy decorations around the bustline and hips. It may also use decorations to emphasize stylistic details such as slits, cutouts, etc. A baladi dress may feature an all-over repetitious design, or it may feature an outline of the edges of the garment (hem, neckline, sleeve edges, slit edges). PHOTO CREDIT: The photo of Shira in the purple fustan raqs designed for her by Eman Zaki was taken by Pixie Vision Productions, Glendale, California. PHOTO CREDITS: The photo of Shira in the black fustan raqs designed by Hanan Mahmoud was taken by André Elbing, Bärbroich, Germany at one of Shira's performances in Egypt. The photos of Shira in the burgundy fustan raqs and the midnight blue fustan raqs (both also designed by Hanan Mahmoud) were taken by Kaylyn Hoskins, Solon, Iowa.